Have taken an epic risk. The tomatoes are already out in the 4TB, nestled in fleece but at the moment uncovered. Have gone a bit purple stemmed; but have not keeled over. 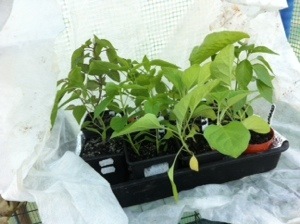 Since they look greens and leafy; I have transferred some of the chillies and aubergines to the Wendy house. These are sat in tented fleece as it is all a bit precarious still. They look reasonably robust; and will all be going into the polytunnel anyway in about a month to six weeks. These are the nine other ones that’s remain. These are significantly smaller, with the two nagas, and two types of scotch bonnet. 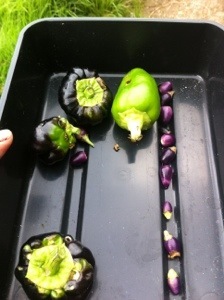 A few weeks ago, I tried to end the being of one of the purple rainbow chillies in the classroom. 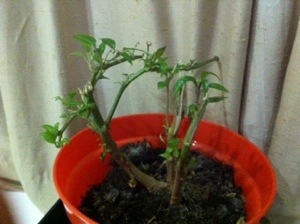 I didn’t think they would survive the winter, and now I won’t have a classroom anyway after the festive period. The time came that the pots had to be brought home. I was about to empty the pot when I saw that this one was actually still going. The leaves are lovely and green. So this one has a temporary stay of existence and is sat on a window sill at home. 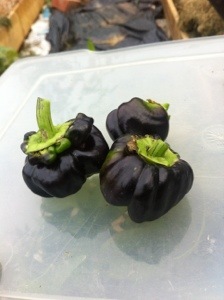 With the start of the new school year the two large pots of purple rainbow chilli were taken back to their birth place. Largely ignored, but watered regularly they have been left to their own devices. This had led to them producing many fruits; now of varying colours. As one student remarked, they look like skittles. Purple beauty sweet peppers. That whilst these aren’t big yet are beautiful. Plunderer today with some others. Having collected a handful of purple rainbow chillies, I wanted to do something with them. Whilst a single solitary one, made it into a courgette chutney ( http://www.rivercottage.net/users/Pam%20the%20Jam/blog/1281015134-courgette-aid-and-jam-fest/ ). I wanted to make further use of the rest. The chillies are small, berry like. And quite full of seeds. There are additional chillies in the wendy. I have been impatient, and harvested a few non green Nigels, as well as some green frauzauber, These are a lovely lime colour. I have yet to ascertain, whether this is a sweet or a spicy chilli. it went in regardless. There was some nervousness about this recipe. In particular, with the quantities. I didn’t want make too much of it, and how would I know if it had boiled properly to then set. 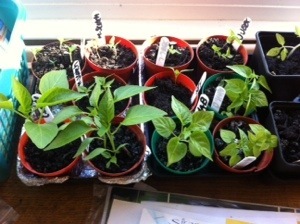 The home grown chillies, were padded out with two large red chillies, and one and a half sweet red peppers. 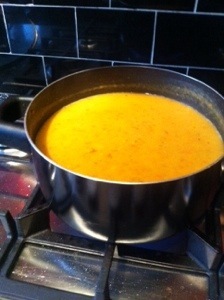 I did panic abit, with the boiling, and the mixture was boiling for 15, rather than 10 minutes. Wobbled beautifully, whilst cooling. 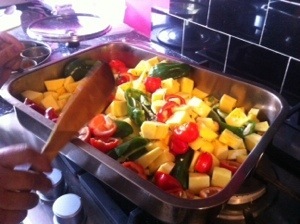 There was the flecking floating too, of the chopped up chillies. Definitely in the wobble and the flecking. The verdict. It tastes lovely! Consistency wasn’t bad. Depending on how much you have, it either wobbles like jelly, or splodges like jam. 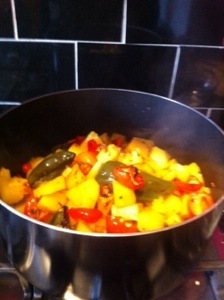 The flavour is a lot like a sweet chilli sauce, just with a different texture. Goes lovely with the dipping crisps, we know that for a fact. It is also wonderfully more-ish. I love my spicy little triffid monsters. These leafy, flowered beauties have taken up the kitchen window sill for some time now. 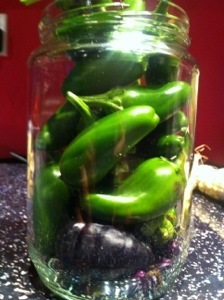 Little berry sized chillies have formed; today I harvested those of a reasonable size. I felt compelled to as there are a lot of flowers but also a number of these self abort and fall off. 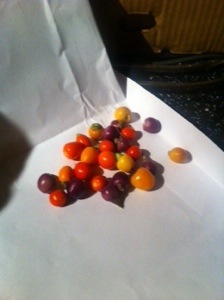 The vague plan with these, is to possibly make an experimental batch of chilli jam. And with the jam making. I tried to make a courgette chutney. 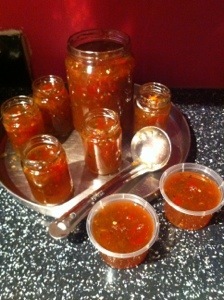 The recipe is from pam the jam at river cottage. And is tenuously Bollywood. It now sits in the fridge. Ready for consumption. Another lovely day, so off to the plot I went. Managed to do a bit of newspapering and black plastic-ing, before the newspaper ran out. Dandelion leaves were also chopped down. I realise that it is better to dig them out, or attack with weedkiller. This may well happen, in the not so distant future. Further to the previous crop, in the efforts to tidy up; a few more bulbs of garlic were forked out. Who would have thought, that after the tomato tantrums of earlier this year; they would actually take off. 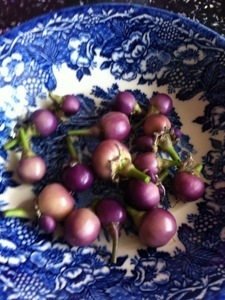 The one variety that I am aware of is Ukrainian Purple that was kindly given to me. There are quite a few flowers forming, indicating that some form of crop will occur. I can confess that I haven’t taken off any side shoots. Which is why, the raised beds resemble something of a jungle. There is a mixture, therefore, of bush and vine tomatoes. Nestled around the edges, are smaller let spread out varieties. Something else that has somewhat taken flight, are the sunflowers. I must confess, that I couldn’t tell you whether they are little ones or big ones. Yet, these seem pretty huge to me! I had been expecting them to be about ankle height. These are now very hobbit sized, and at a various positions on the plot and enjoying the sunshine. Jack be little is one of the many squashes dotted around. Below is a image of a flower thrown up by Jack. 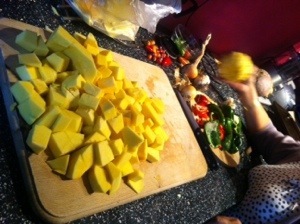 I will be keeping a close eye on the other squashes such as sweet dumpling, patty pan and yellow scallop. Whilst they have started to form huge great big habits, there are not many flowers of either female or male persuasion.
. Jack has sent out a singular vine, attached to which is one very small jack be little pumpkin. All very newly formed in the last few days. Jack’s colleague Hooligan, resides on the other side of the plot, and is very diminutive in comparison. Much smaller sprawl and much smaller leaves. A reflection perhaps of early child trauma as it did have to be moved when first planted out. The one squash that still resides in open ground is the cobnut, and this is only just starting to get bigger. These are very, very tiny, and were easily missed. Previously, we have seen up to five babies form. All bar one being taken off. It will be interesting to see how these develop over the coming months. The leaves are certainly getting bigger and the vine is starting to sprawl out over the side of the raised bed. A few of the berries are starting to expand. I’m not quite sure as to how big they actually get, or how potent they might be. In the wendy house, the chillies and bells continue to be fed and watered. It is sad that to say that some of them have been a bit scorched by the sun. The Purple Beauty in particular. However, there are a few walnut sized sweet peppers being formed, and a singular, solitary thin chilli that may well be a cayenne or a long thai. 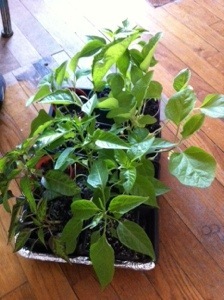 These two pots contain six blossoming and burgeoning purple rainbow chillies. The seeds of which were from Real seeds. I am so very glad that these came home from the classroom, as they have really taken off whilst sat on the window sill of Mama’s kitchen. One small purple chillie was spotted yesterday, and another was spotted this evening in taking the above picture. They have reached the heady heights of 60 cm. That is how high the green plant supports are. I firmly believe that the current heat wave has inspired the blooming nature of these beauties. They previously looked altogether weary and not so full bodied. There are more leaves, more of the lilac rimmed flowers bursting into life. I had been wondering as to when they would all kick off. The tiny little chillies are little round domed bubbles. A lot like berries, I suppose.A beautiful shade of mauve; not really Cadbury purple. I’m intrigued as to with what the colour changes will be. I have never seen a chilli or a pepper start off with a coloured fruit. So used to seeing them start of as green fruit. Bit of an opposite process with these. It remains to be seen as to how potent these will be. And being in the kitchen, best place to find out.